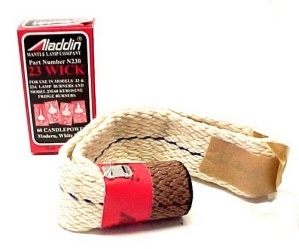 Genuine Aladdin Lamp, Heater, or Refrigerator Wick N230, P239936 Brand New in box. This Lighting Replacement Fits Models 23, 23A Lamp Burners and 23E60 Kerosene Fridge Burners. Long Tail. 60 Candlepower. Modern White Light.